Margaret Thatcher was the United Kingdom's first female Prime Minister (1979-1990), and she is one of the dominant political figures of 20th century Britain. 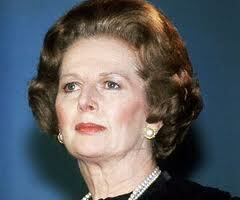 She won three successive General Elections and served as British Prime Minister for more than eleven years. Margaret Thatcher earned the nickname "Iron Lady" as a result of her conservative polices, her hard line against Trade Unions and her rhetoric in opposition to the Soviet Union. Mrs. Thatcher strongly believed in deregulation of the financial sector, the sale or closure of State owned companies, the withdrawal of State sponsored subsidies and flexible labor markets. During her term of office she challenged and sought to reshaped almost every aspect of British politics (By successfully shifting British economic and foreign policy to the right), reviving the economy, reforming outdated institutions, and reinvigorating the nation's foreign policy. In politics if you want anything said, ask a man. knowing that it is not enough, that you have got to have hard work and a certain sense of purpose. I don't expect anyone just to sit there and agree with me, that's not their job. It's not a day when you lounge around doing nothing; it's when you've had everything to do and you've done it. hers is not to preserve a man-made world, but to create a human world by the infusion of the feminine element into all of its activities. If you would like to know more about Mrs. Thatcher, please visit the website of the Margaret Thatcher Foundation, the largest contemporary history site of its kind. They offer free access to thousands of historical documents relating to the Thatcher period.